We've been dying to know more about Microsoft's Courier tablet / e-book device ever since we first caught wind of it last September, and while our entreaties to Mr. Ballmer went unanswered, we just learned some very interesting information from an extremely trusted source. We're told Courier will function as a "digital journal," and it's designed to be seriously portable: it's under an inch thick, weighs a little over a pound, and isn't much bigger than a 5x7 photo when closed. That's a lot smaller than we expected -- this new picture really puts it into perspective -- and the internals apparently reflect that emphasis on mobility: rather than Windows 7, we're told the Courier is built on Tegra 2 and runs on the same OS as the Zune HD, Pink, and Windows Mobile 7 Series, which we're taking to mean Windows CE 6. As we've heard, the interface appears to be pen-based and centered around drawing and writing, with built-in handwriting recognition and a corresponding web site that allows access to everything entered into the device in a blog-like format complete with comments. We're also hearing that there will be a built-in camera, and there's a headphone jack for media playback. 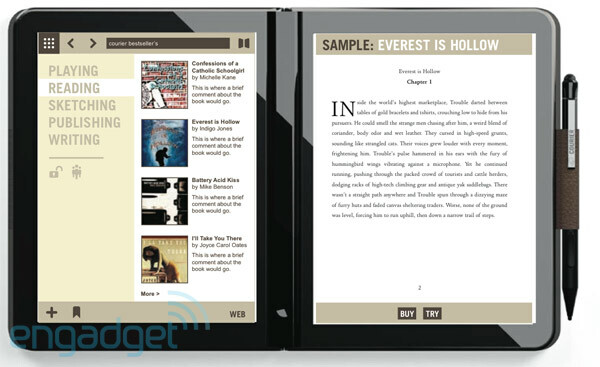 Most interestingly, it looks like the Courier will also serve as Microsoft's e-book device, with a dedicated ecosystem centered around reading. It all sounds spectacular, but all we have for a launch date is "Q3 / Q4", and we have no idea how much it's going to cost, so we're trying to maintain a healthy skepticism until any of this gets official -- call us any time, Microsoft. One more pic showing the interface after the break. Update: We've added a gallery of user interface shots -- some of which we've seen and some of which are new. Update 2: We've just gotten two full-length HD videos of the interface in action. We've seen parts of these before, but there's some new stuff here that's quite interesting. Check it below.